My daughter is obsessed with this book! She wants to read it again and again and again. It’s small and very thick, so it would be really hard to damage, even for a 1-year old. And while it features a bee, two bunnies make an appearance, making it even cuter as an Easter basket addition! They are really easy for little ones to hold and drink, but they can close shut so that they don’t leak! They also have a little weight at the end of the straw that helps make sure they’re sucking water and not air. Oh, and if that’s not enough, they are so adorable! My daughter got this purse for Christmas and absolutely loved it! She is constantly filling it with things she finds around the house, which is hilarious and adorable. 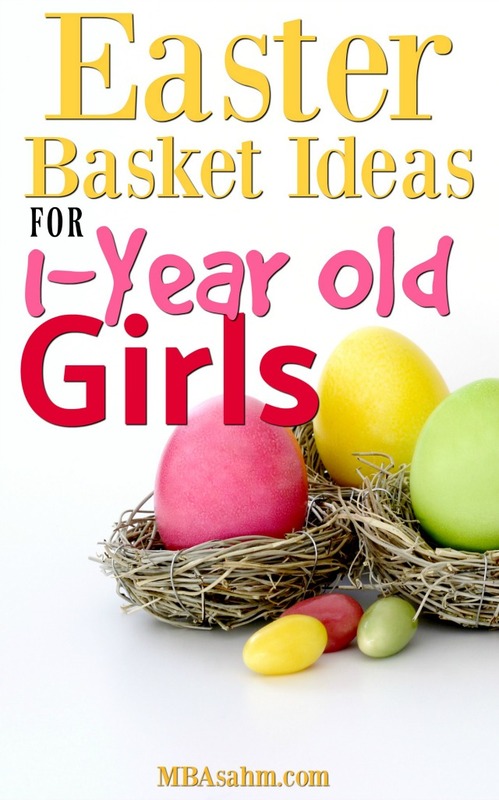 It’s the perfect kind of gift for a 1-year old girl and will fit perfectly into an Easter basket. And if you’re a family that attends Easter mass, you’ve got your accessory AND distraction ready. Bath toys are my go-to gift for any child that still takes baths! They’re almost always inexpensive, they are rarely battery-operated, and bath time should be a happy, fun time for kids. It’s also a good idea to switch out bath toys when they start to get grimy, so you can’t have too many. Pat the Bunny is one of the greatest books ever written for toddlers. It is interactive, but without batteries (that’s possible ;-)). And as luck would have it, the main character is…yep…a bunny! So it’s absolutely perfect for an Easter basket. My son loved this book so much that my daughter needed a new copy and already LOVES it! These snack catcher cups are absolutely brilliant…and they make EVERYONE happy! Your little girl will be able to carry around her own snack and you (or her parents) won’t have to worry about cleaning up a disastrous mess. They’re easy to clean (just detach and throw in the washer) and they can be thrown in a diaper bag, car, or stroller. These are a must-have, whether for an Easter basket or just because. These magnets are another brilliant gift that everyone will love! Nowadays, more than just the fridge is magnetic. My daughter cruises around the kitchen moving and playing with her magnets on the fridge, the dishwasher, and the trash can. You need to make sure you get ones that are not a choking hazard, so either stick with these ones or read closely to see what size the magnet is. Easter baskets are the perfect place for new spring and summer shoes! 1-year old girls are just learning to master walking – if not running – so they are all of a sudden in need of a collection of shoes. My absolute favorite shoes for 1-year olds have always been Robeez. They are soft-soled, so they are perfect for learning to walk. They also come in the most adorable patterns, so I really recommend you check out all of their options! And if you’re looking for a pair of shoes that are ideal for running around outside, especially in wet weather (because Robeez are best for indoors), Easter is the perfect time for their first pair of Toms! Not only are Toms adorable on them, but there are some styles that actually come matching with adult pairs, so you can get a Mommy & Me set! Check out the main websites (Robeez is here → Robeez website and Toms is here → Toms website) for their full collections, but you can also find a lot of options on Amazon (in case you’re an Amazon Prime kind of person ;-)). Bibs are such a cute idea for 1-year old girls and Easter is the perfect time to add some spring and summer colors! You can find cute bibs in lots of places, but since Easter is a special occasion, this is the perfect time to get an adorable personalized one. As with all things personalized, I would recommend checking out Etsy’s personalized bib selection because they always have adorable homemade options like this one. I’m not sure there’s ever an occasion not to get your 1-year old more bows! If you still have a baldy on your hands like I do, then you need to check out these headband bows! I have been using them on my daughter since she was a newborn and I still love them to this day. She is always wearing them! And of course, if your little one is already growing hair, then this is the perfect opportunity to get her some adorable barrettes! 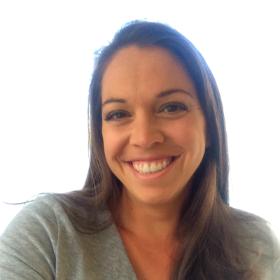 I hope this list was helpful! 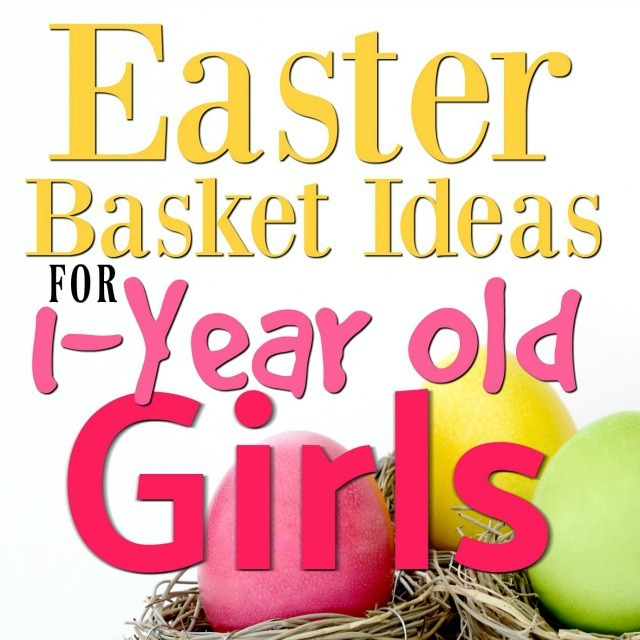 Let me know if you have any other great suggestions for Easter basket ideas for 1-year old girls. Happy Easter!